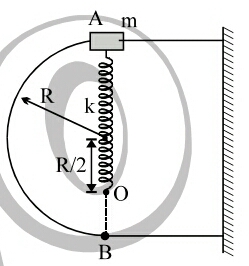 A bead of mass m is tied at one end of a spring of spring constant mg/R and unstretched length R/2 and other end to fixed point O. The smooth semicircular wire frame is fixed in vertical plane. Find the normal reaction between bead and wire just before it reaches the lowest point. From this I got cetripetal force as 5mg towards the centre,O. And gravitational force ,mg at B downwards . Please can you explain your equation for energy conservation? I don't understand it. And how did you get centripetal force $5mgR$? This is not a force. $5mg$ is a force, $5mgR$ is not. How can you post questions like bullets from machine gun whereas I have to wait for approval ? Hi Moto at 200 reputation you will no longer require approval. You have subtracted $mg$ from $5mg$ but you should have added.